Thanks to our good friends at Studio Canal Subculture has ten double passes to giveaway to the brand new film Cold Pursuit which hits cinemas on Feb 7th. To WIN simply go to our Facebook page and tell us what your favourite Liam Neeson movie is. Welcome to Kehoe, it’s -10 degrees and counting at this glitzy ski resort in the Rocky Mountains. The local police aren’t used to much action until the son of unassuming town snowplough driver, Nels Coxman (Liam Neeson – Schindler’s List, The Grey), is murdered at the order of Viking (Tom Bateman – Murder On The Orient Express, Da Vinci’s Demons), a flamboyant drug lord. Fueled by rage and armed with heavy machinery, Nels sets out to dismantle the cartel one man at a time, but his understanding of murder comes mainly from what he read in a crime novel. As the bodies pile up, his actions ignite a turf war between Viking and his long-standing rival White Bull (Tom Jackson – Star Trek: The Next Generation, Skinwalkers), a soulful Native-American mafia boss, that will quickly escalate and turn the small town’s bright white slopes blood-red. In-Cinemas February 7. 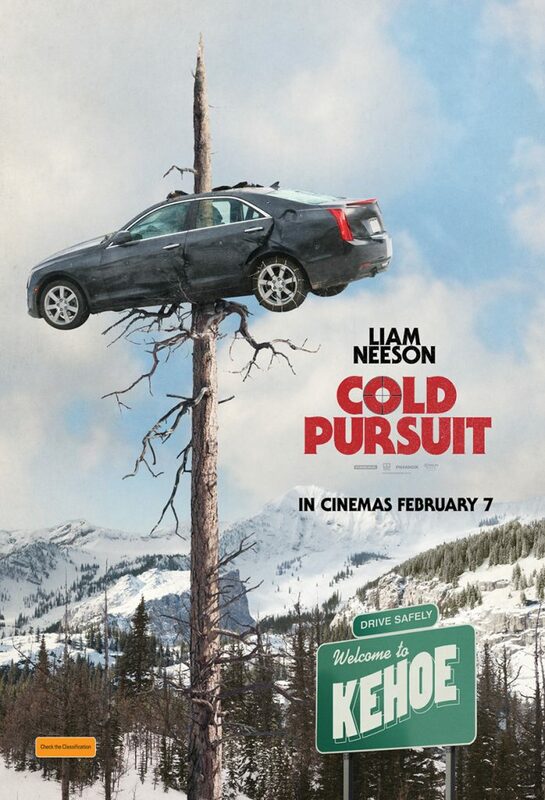 Cold Pursuit will be released in Australian cinemas through Studio Canal on the 7th February 2019.